Guess how much they are? 135 Euros!!! That's $180 for you folks at home. Now, good for you if you have that kind of money to burn, but my dears, what is a girl to do when she has no money and lots of leftover yarn? 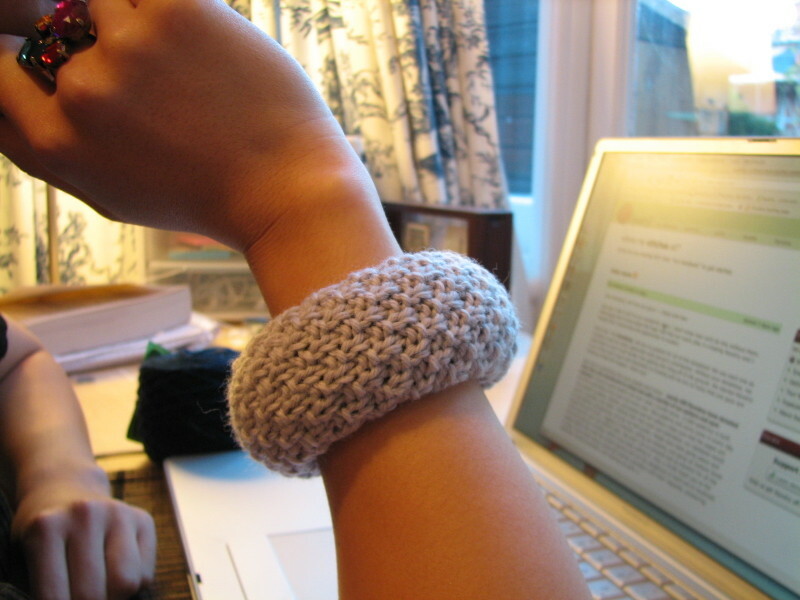 Why, you get your needles out and make yourself a (couple of) Swatch Bangles! 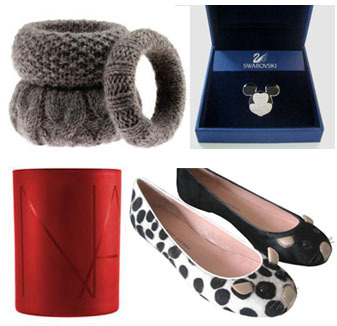 Named so because it's literally made of a knit swatch and a bangle. Oh and the good sense you were born with. I'm so pleased with the results that I went beyond the call of duty and put together a pictorial so that you can save yourself $180 too. Yarn - doesn't matter what kind as long as it's not too bulky (can't fit your hand in the bangle otherwise) My gray bangle is Knit Picks merino style which is a DK weight. Needles - whatever your yarn of choice recommends for gauge. This will be the width of your swatch. 2. 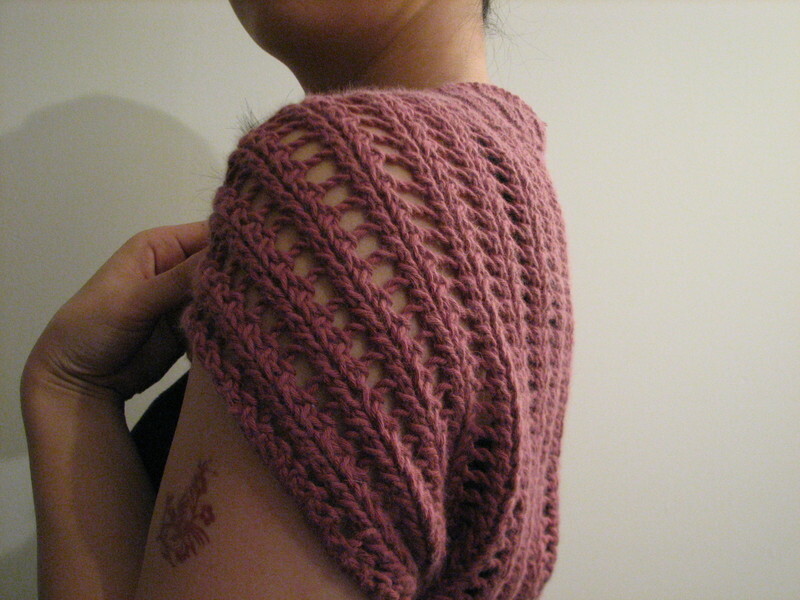 Pick a stitch, any stitch and start swatching! 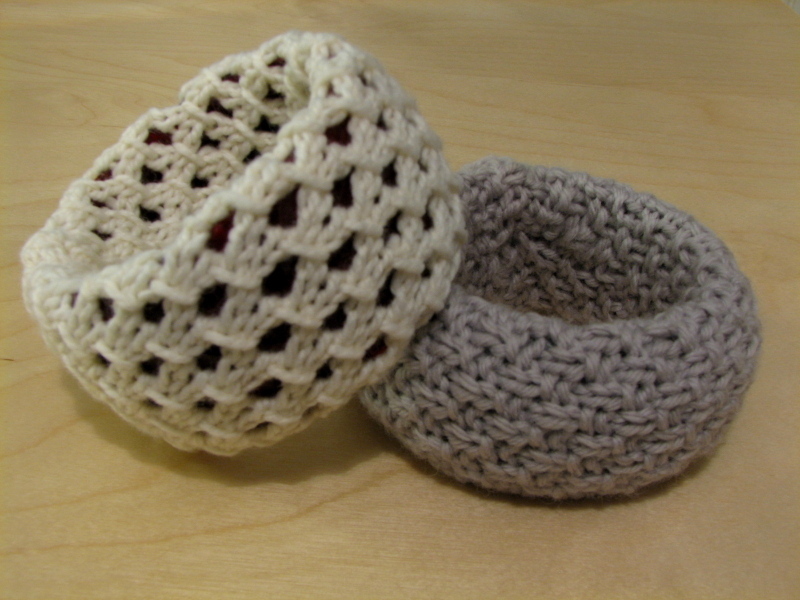 My gray bangle is a Moss stitch and my white one is something called Crocus Bud. I got my projected width usually by my second try. 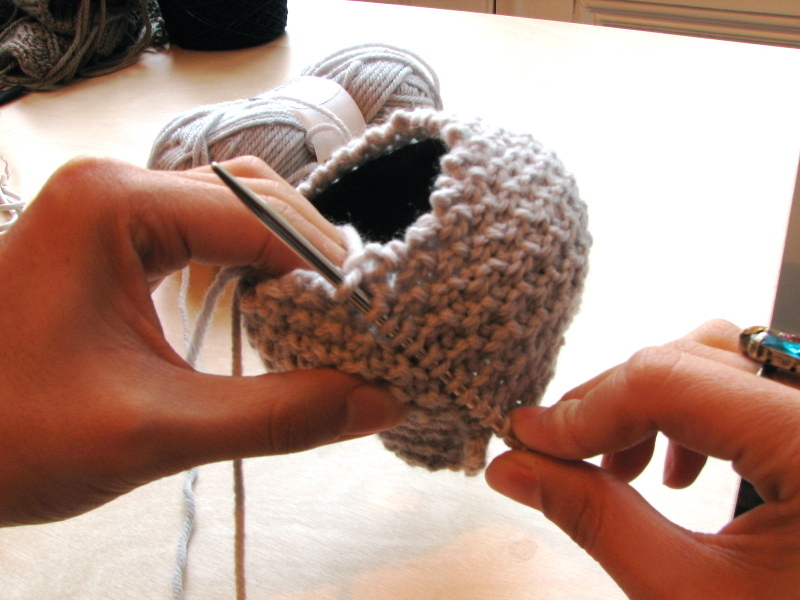 It doesn't have to be perfectly exact, since luckily yarn is usually stretchy when knitted up. 4. 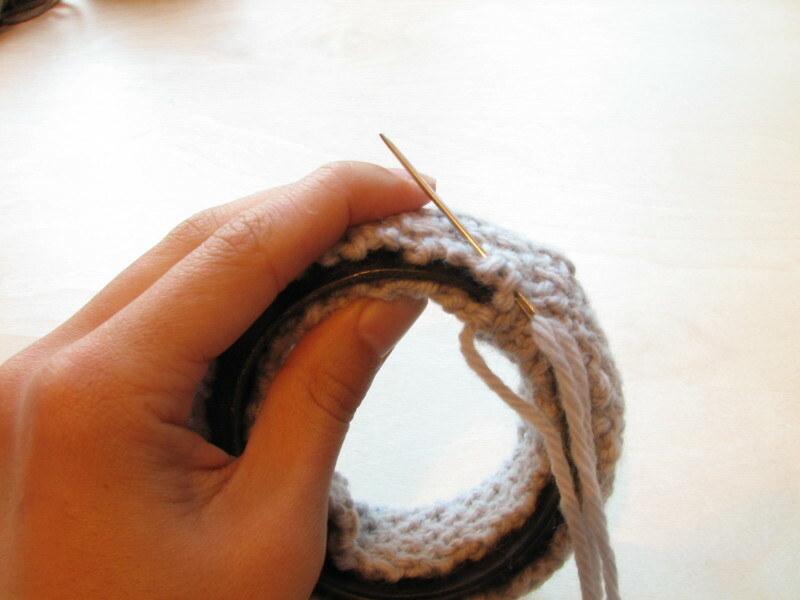 Bind off. 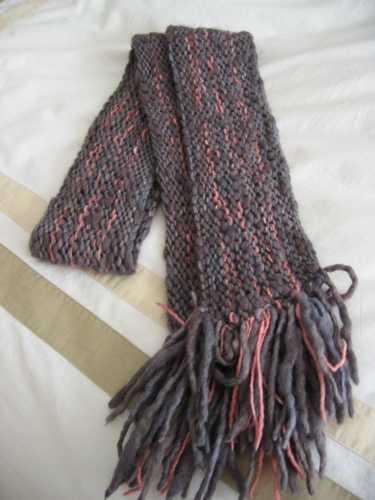 Cut the end but leave yourself PLENTY of extra yarn. You will be using this to seam. I left about 24" and that was plenty. 5. Seam the cast on end to the bound off end. 8. 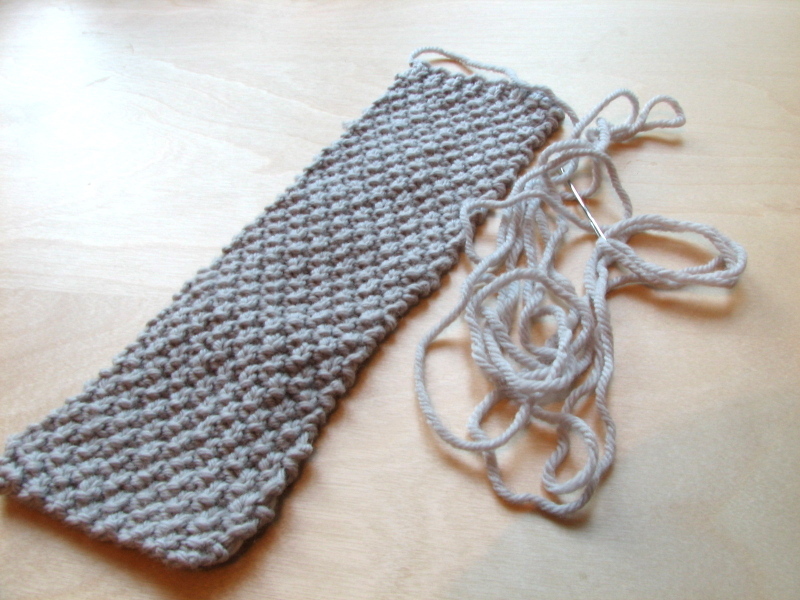 Weave in the yarn a bit and then cut it off. 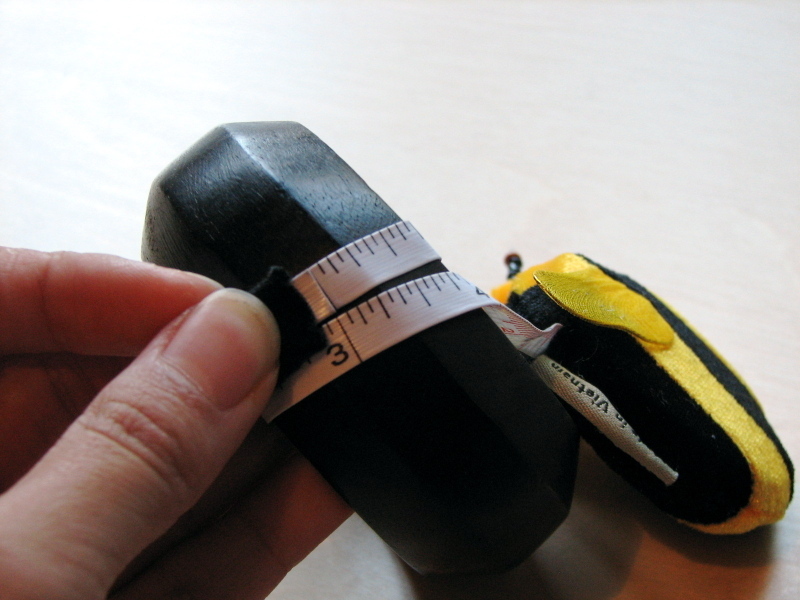 Rearrange the swatch so that the long seam is on the inside of the bangle. 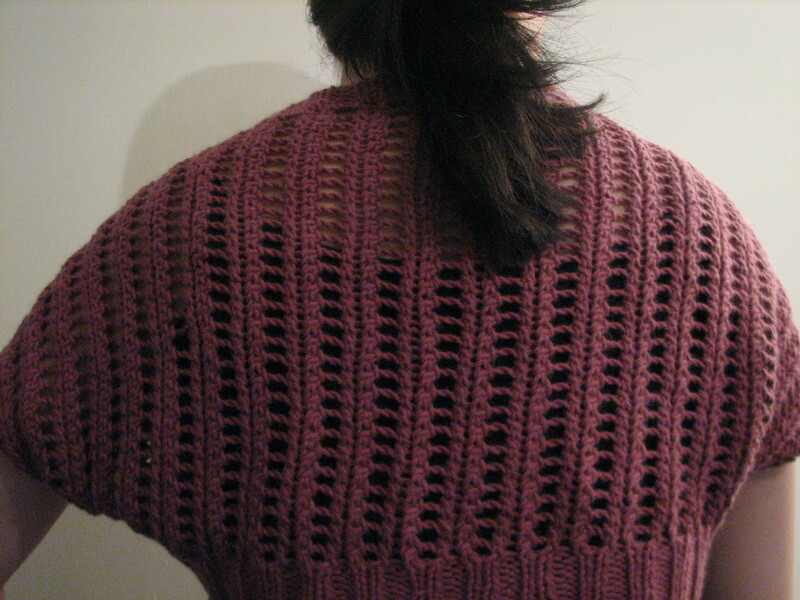 I love that it used up leftover yarn, it was a quick knit, and I didn't have to worry about being too neat or precise. 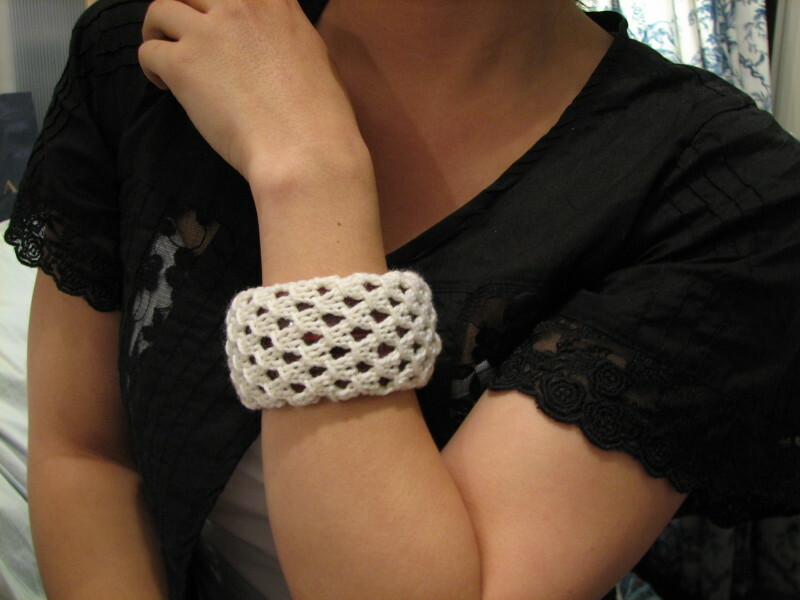 I like both the textured stitch as well as the lacy one, which allows the red of the bangle to show through. 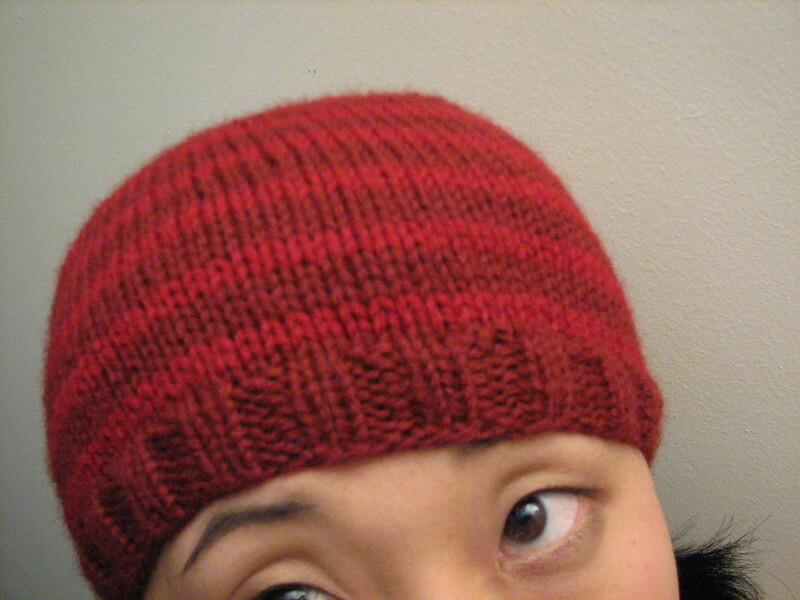 A plain stitch with variegated yarn would be great too I think. 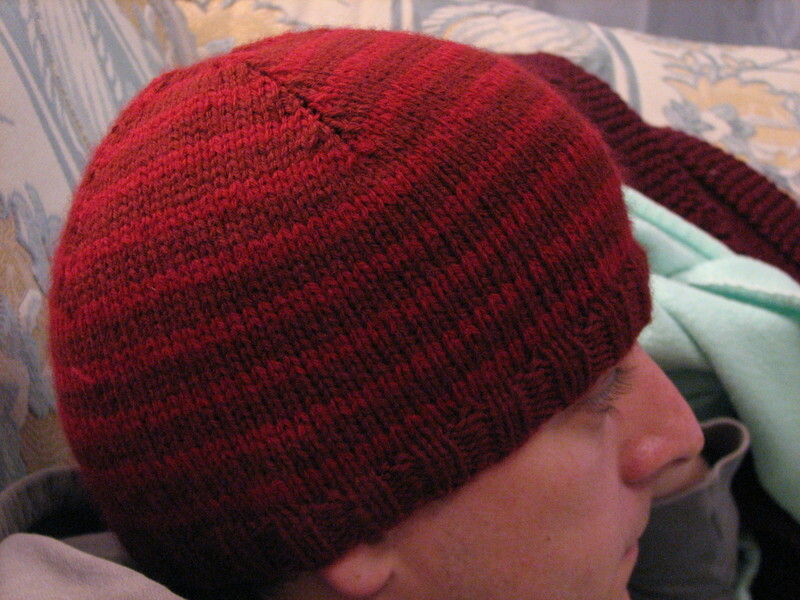 I first started out with some Manos but it was pooling so I just switched to a single color yarn. Sock yarn's an interesting possibility, but that might go against the whole "Make two in two days" lure of the project. I think a cable stitch or a rib stitch like the one that's for sale would also be cute, but I ran out of bangles. Which brings me to the best bit: If I get tired of these I can just cut the swatch off and make a new one! In an attempt to drag my friend Sar back into the knitting world, I piqued her interest with this adorable clutch pattern from Yarn Magazine. Now, being on a strict yarn diet, I had to improvise with the stash that I had, so I made adjustments and made it with one skein of Berocco's Ultra Alpaca in white and some Peruvian Baby Alpaca (leftover from Hourglass) for the trim. 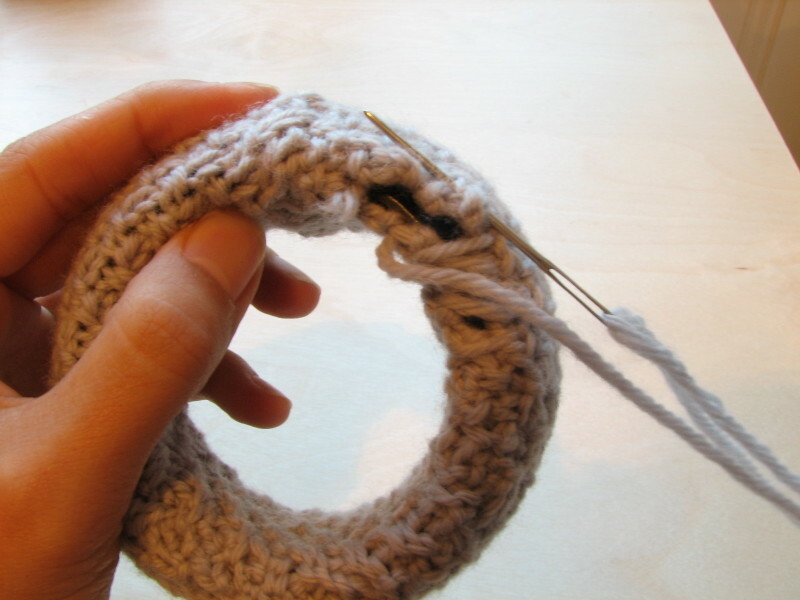 I cast on enough to do three cable repeats instead of one. The size is a tad larger than I expected, but I still really like it! The brooch was something I bought from Forever 21 like two years ago, and typical of Forever 21 it promptly fell off after I took the picture. 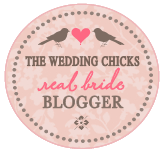 I'll try to fix it or I may go with a big maroon polka dot ribbon. Still deciding. The lining was from JoAnn's and I just fused it to some interfacing to make the clutch more sturdy. All in all a fun, quick project. 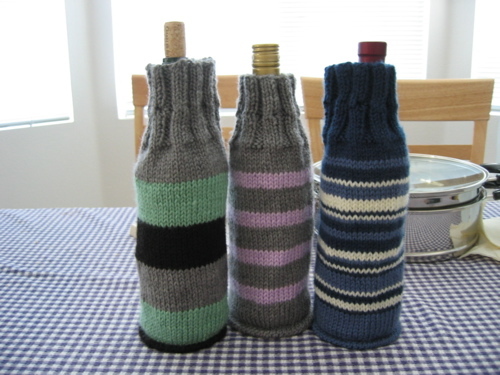 When I get through my stash enough I'm going to make this again with chunkier yarn for a possible gift. Jury duty is over and the washcloths are finished!